The death toll from a train crash south of Cairo has reached 18. 39 people were injured in yesterday's accident involving two passenger trains. The accident happened when a first class train rammed into a nearly empty stationary train on the same track, security sources said. Witnesses suggested the first train had stopped after it struck a cow. The moving train was headed south from Cairo toward Assiut and Aswan, a major tourist attraction and the site of Pharaonic ruins, security sources said. An Egyptian railway authority official said a technical committee had been set up to investigate the cause of the crash. A series of road and rail accidents in Egypt in recent years has triggered an outcry over the government's handling of transport safety. Saturday's accident took place in al-Ayyat, which in 2002 was the scene of Egypt's worst rail disaster when fire ripped through seven carriages of an overcrowded passenger train, killing at least 360 people. 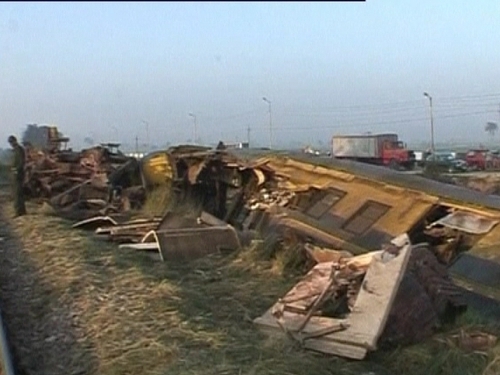 A train crash in northern Egypt killed 44 people in 2008, two years after a crash that killed 58 people.